Bitcoin and Daily Fantasy Sports (DFS) both were introduced almost around the same time. Both of these industries now have over billion dollars in revenue, and continue to grow at a constant pace. When it comes to playing fantasy sports online, you need not necessarily pay money because there are many major fantasy sports betting platforms that host free games to attract and enable fantasy sports enthusiasts to participate just for fun. Some of those platforms also conduct contests every now and then, in which you can participate for free but win actual prizes. However, once you start enjoying the whole fantasy sports league scenario and become more serious about winning, you will have to spend some of your money, and this is where Bitcoin comes into play. Bitcoin is a popular virtual currency that has been into existence for quite a few years now and is preferred mostly by online betting enthusiasts, including fantast sports bettors, mainly due to its ability to make transactions anonymously, without any sort of interference from governments. So, if you have been looking for a great DFS platform where you can use your Bitcoins to the fullest potential, try FastFantasy. FastFantasy – what’s it about? FastFantasy.com is basically a new addition to the online Daily Fantasy Sports scenario. Established by six digital media and iGaming experts, the platform is widely known to be an innovator in the online DFS industry within a short span of its launch. 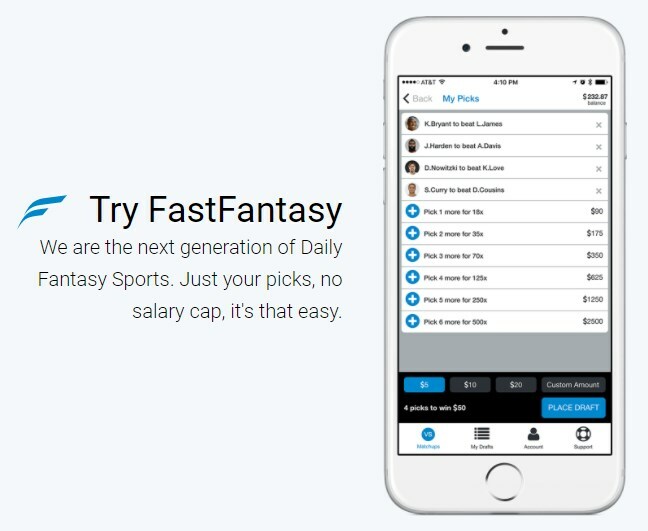 What’s interesting about FastFantasy is that the company claims to be offering new and simplified games for fantasy sports players, with a higher win ratio, which means that your chance of making money on this website is more when compared to other industry leaders. The games offered by FastFantasy are known to be developed by people who are fantasy sports players themselves, which leads us to believe that the games would have been designed from a typical player’s perspective. The company also promises to provide greater integrity and protection when compared to conventional DFS operators, which is another strong claim they manage to keep up. The facts that this fantasy sports betting app was launched only last year, 2016, but has managed to gain a great name and reputation for itself make us believe that we are dealing with a reliable platform that must be doing something positive for its players. It has to be mentioned that despite choosing an industry that is now being dominated by two giants, FastFantasy seems to manage the competition quite great, meeting the expectations of its players and making sure that they leave the website happy. By launching their app, FastFantasy has brought in a unique twist to fantasy sports betting by enabling players to have a go at star players, such as Stephen Curry, Lebron James, etc., with their new performance system that is based on athlete vs. athlete scenes. In this system, the game stats of one athlete will be played off against another, and you will have to place your bets on which player you think will do better in any particular game. Also, similar to any other fantasy sports betting platform, FastFantasy also has a point rubric of its own for all its in game actions such as touchdowns, goals, assists, blocks, and more. To play your favorite fantasy sports league on the FastFantasy app, you should first pick a player who you think will finish with a better fantasy score in his fight with another player. You will be required to choose at least four players, with the maximum limit set at 10 players. After this, you can submit your roster by choosing an entry fee that could range between $1 and $20. There are charts available on the company’s website according to which the players you select will accumulate points. If all your players have higher score at the end, you win. However, if two competing players finish with the same points, the matchup will be considered tie, and hence will be declared null and void. The same will be the case if a player has zero minutes played or no plays. There are other similar conditions that determine how and how much you win. Since the site basically operates via its app, you get easy access to fantasy leagues right from the convenience of your smartphone. The app is designed to be highly intuitive, and there is no doubt that you will find it easy to navigate around the app and place your bets. The app comes with all necessary information you would require to know how the platform works and proceed accordingly. The app is currently available for iOS and Android devices. Setting up an account with FastFantasy is also easy. This is also done on the app, and since the platform wants everything to be legal, we could see that the account setup phase is quite strict. When it comes to deposits and withdrawals, the platform currently supports only MasterCard, Visa, and American Express credit card transactions; in the case of withdrawals, you have an additional ACH option. But, they do promise that more transaction methods will be added soon; so, you still have to wait to have Bitcoin included to their list. The platform does not specify anything about formal bonuses or promotions. However, they do offer temporary bonuses via their social media pages. While these bonuses are said to be credited directly to your FastFantasy account, you cannot withdraw the same unless and until you wager an equivalent amount. You have two options to contact FastFantasy’s customer support team: via their hotline and by sending an email to support@fastfantasy.com. There is no 24/7 support or live chat facility. However, they are known to respond to emails rapidly. Easily accessible and easy-to-use mobile app. Available for players from the US and Canada only. Yes, you should! FastFantasy is possibly the only online fantasy sports betting platform that is available exclusively for mobile devices. Overlooking the minor negatives, this is one DFS platform you should definitely try.